Director of the Heydar Aliyev Foundation Anar Alakbarov hailed the development of Azerbaijan-France relations, Azertag reported. He said that the Heydar Aliyev Foundation and the Heydar Aliyev Center implement a number of projects in the field of culture. 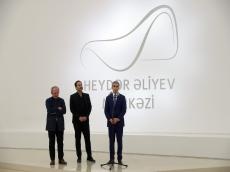 Director of the Heydar Aliyev Foundation stressed that works of such famous sculptors and artists as Bernard Buffet and Laurence Jenkel were previously showcased at the Heydar Aliyev Center. The exhibition curator Mark Hashim expressed his gratitude to the organizers for the pleasant opportunity to present the works of Mauro Korda in such a grand place - the Heydar Aliyev Center. "I am sure that these works of art will cause you great interest, you will discover them for yourself," said the curator. Afterwards, Mauro Corda informed the event participants about his sculptures. He noted that the works on display are examples of art that set all feelings in motion. These works are examples of French sculpture based on sustainable ideas. Then the event participants viewed the exhibition. The portrait genre occupies a special place in Corda’s works. The artists is striving to present human inner world in various milieu and situations using a variety of materials ranging from bronze to ceramics, metal, marble, etc. The wildlife is another area of Mauro Corda’s concentration. Abrupt extinction of certain endangered species is among the major objectives of this type of sculptures. The artist’s main message is the risk of some ordinary animals to become a sort of miracle both in wildlife and in zoos really soon. The exhibition will last till September 15.